In 2019, Sarahn Says is here to help you adopt healthy habits. While one day of positive action towards improving your health is great, real transformation comes from consistency and developing healthy habits. 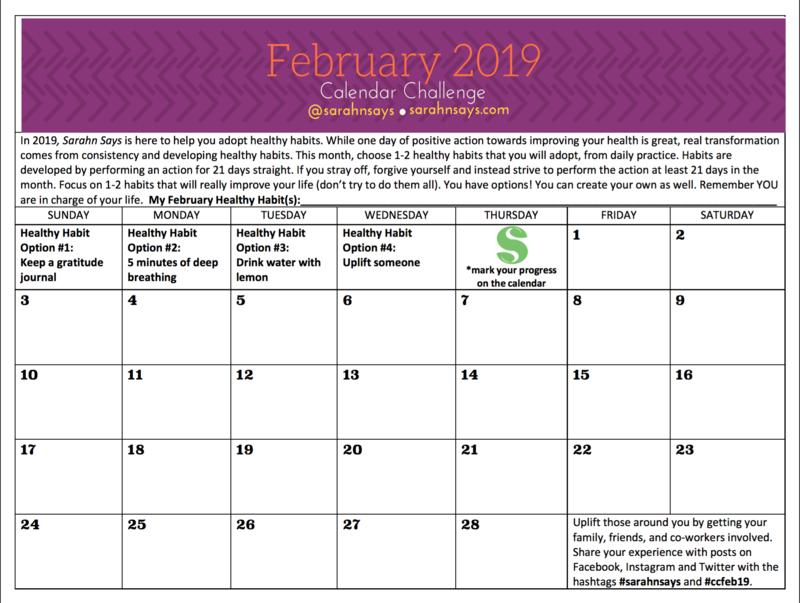 This month, choose 1-2 healthy habits that you will adopt, from daily practice. Habits are developed by performing an action for 21 days straight. If you stray off, forgive yourself and instead strive to perform the action at least 21 days in the month. Focus on 1-2 habits that will really improve your life (don’t try to do them all). You have options! You can create your own as well. Remember YOU are in charge of your health. Uplift those around you by getting your family, friends, and co-workers involved. Share your experience with posts on Facebook, Instagram and Twitter with the hashtags #sarahnsays and #ccfeb19.